This is a list of all the user roles that you have in the system. 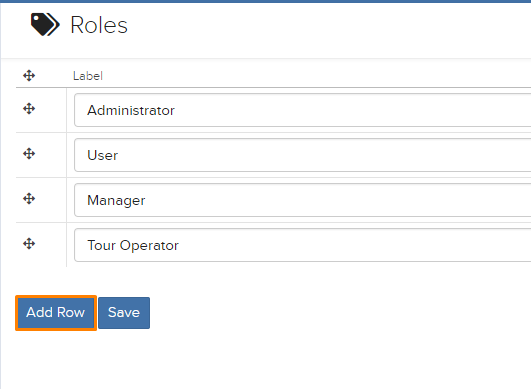 By default, the system creates 4 user roles, Administrator, User, Manager and Tour Operator. You can edit and delete these 4 created user roles. This page is located under the User Management category in the settings, highlighted in dark blue in the picture below. How to add a new user role? Click on the blue “Add Row” button located on the bottom left of the table, highlighted in orange in the picture below. Once you have clicked the button, a new blank row will appear at the bottom of the table. 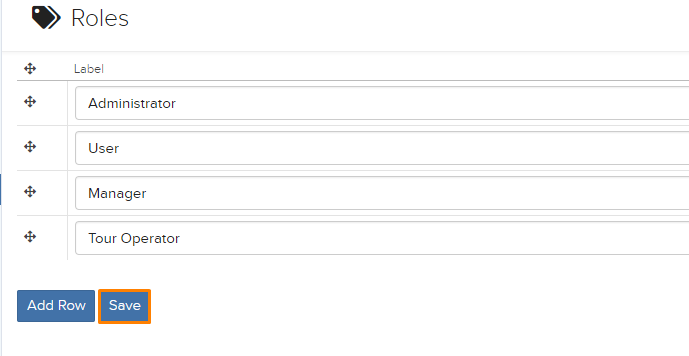 Next, fill in the title of this new role in the new blank row and select whether the role is active. Then, click the blue “Save” button, highlighted in orange in the picture. Do not worry about the “handle” column the system will automatically update the handle to suit to whatever you have keyed in under Label.